Location: The Walters Art Museum, Baltimore. John 19:31-37 - Now it was the day of Preparation, and the next day was to be a special Sabbath. Because the Jewish leaders did not want the bodies left on the crosses during the Sabbath, they asked Pilate to have the legs broken and the bodies taken down. The soldiers therefore came and broke the legs of the first man who had been crucified with Jesus, and then those of the other. But when they came to Jesus and found that he was already dead, they did not break his legs. Instead, one of the soldiers pierced Jesus’ side with a spear, bringing a sudden flow of blood and water. The man who saw it has given testimony, and his testimony is true. He knows that he tells the truth, and he testifies so that you also may believe. These things happened so that the scripture would be fulfilled: “Not one of his bones will be broken,” and, as another scripture says, “They will look on the one they have pierced. Sharply silhouetted against the darkened sky is the dying Christ. A couple of gesturing spectators appear at the left, and on the right are two mounted Roman soldiers with billowing banners. Other onlookers are visible in the mid-ground. Although not a practicing Christian, Delacroix painted a number of New Testament subjects. Evidently, he was attracted to the drama of Christ's Passion and was endeavoring to deal with issues of personal faith raised by Christ's human and divine nature. 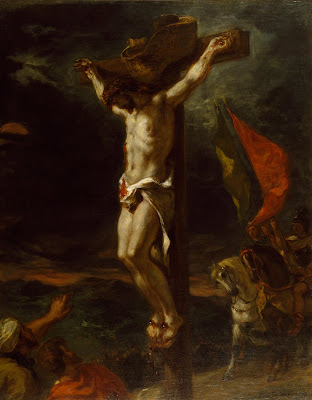 When this work was exhibited at the Paris Salon in 1847, the critics enthusiastically praised it, noting its affinities with Crucifixion scenes by the great Flemish master Peter Paul Rubens. Ferdinand Victor Eugene Delacroix (April 1798 – August 1863) was a French Romantic artist regarded from the outset of his career as a leader of the French Romantic school. In 1815 he entered the studio of the neoclassical painter Pierre Narcisse Guérin, where he met Théodore Géricault, a romantic painter by whom he was much influenced. Delacroix took for his inspiration the art of Rubens and painters of the Venetian Renaissance, with an attendant emphasis on color and movement rather than clarity of outline and carefully modeled form. Delacroix's use of expressive brushstrokes and his study of the optical effects of color profoundly shaped the work of the Impressionists, while his passion for the exotic inspired the artists of the Symbolist movement.